Description: Hank Jones, who has just turned 90, is still wowing audiences around the world with his elegant swing and "magic touch." Now we have his latest trio recording from the Japanese Eighty-Eight's label, and it is another masterpiece! The tradition of combining Hank Jones with an unexpected rhythm section continues in this wonderfully recorded hybrid SACD. 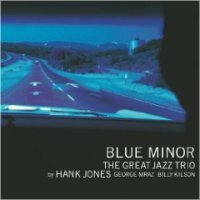 The latest iteration of Jones' Great Jazz Trio includes veteran bassist George Mraz and explosive Billy Kilson who represents a new generation of jazz drummers. His sharp and powerful drumming is surely one of the highlights of this album. Two guests add variations to the program. Japanese singer Keiko Lee sings "I Let A Song Go Out Of My Heart" and another Japanese singer and trumpeter Toku appears on "My Ideal," a song made famous by Chet Baker. More than anything, however, the star of the show is Hank Jones. He is a true master whose delicate touch and perfect control of the keyboard coaxes stunningly beautiful sounds out of the piano. As is always the case with Eighty-Eight's, the set was beautifully recorded in pure DSD at Sony Studios in Tokyo. This hybrid SACD, which plays both on SACD and CD players, has a newly developed green coating on the label side which people at Sony found to enhance the sound quality. The sound is open, detailed and dynamic. The purity of the tone of the piano and the life-like reproduction of explosive drum solos are stunning. Highly recommended! Produced by Yasohachi "88" Itoh. Recorded and mixed at Sony Music Studios Tokyo in September, 2008. This is a hybrid SACD derived of pure DSD recording, containing an SACD stereo layer and a CD stereo layer. This disc is compatible with all regular CD players.